Thirteen years after its first, failed attempt to place a rover on Mars, Europe reaches a crucial stage Sunday in a fresh quest to scour the Red Planet for signs of life, this time with Russia. Mission controllers will instruct a spacecraft about 175 million kilometers (109 million miles) from Earth to release and steer a paddling pool-sized lander towards the Red Planet’s cold, dry surface. Scheduled to arrive next Wednesday (October 19), the short-lived lander’s sole purpose is to prepare the way for a subsequent rover which will drill into Mars in search of extra-terrestrial life. The lander and the TGO—which will enter into orbit around Mars to sniff its atmosphere for gases excreted by living organisms—comprise the first phase of the joint European-Russian ExoMars project. It was finally spotted in January 2015 in a NASA picture of Mars. It showed that even though Beagle 2 failed to establish contact, it had successfully landed.The United States is alone in having successfully operated rovers on Mars. If there is life on Mars, it is unlikely to be found on the surface, which is bombarded by ultraviolet and cosmic rays. But scientists say traces of methane in Mars’ thin atmosphere may be an indicator of something stirring underground. Methane also does not survive the Sun’s ultraviolet rays for long, McCaughrean explained. It is hoped that the ExoMars rover—equipped to drill two-metres (six feet) below the surface—will yield some clues as to the provenance of Mars’ methane. In the meantime, Schiaparelli’s exploits will be crucial in designing the rover’s landing gear. The lander will separate from the TGO around 1430 GMT on Sunday, about a million kilometers (621,000 miles) from the Red Planet. It will enter the atmosphere on Wednesday at an altitude of some 121 km and a speed of nearly 21,000 km (13,000 miles) per hour. The hot and bumpy trip through Mars’ atmosphere will take six minutes. To protect the lander, an “aeroshell” will absorb and dissipate the heat generated by atmospheric drag for the first three or four minutes. When it has reached an altitude of 11 km and slowed to 1,700 km/hr, a supersonic parachute will be deployed, the ESA said. After slowing further and jettisoning its shell and parachute, Schiaparelli will activate nine speed-control thrusters. It will briefly hover at an altitude of two metres before cutting its engines and falling to the surface. The impact is meant to be absorbed by a crushable structure in the lander’s belly—similar to a car’s crumple zone. With a 10-minute delay—the time it takes for a message to reach Earth—Schiaparelli will send data on temperature, humidity, density profile and electrical properties. Battery-driven and without solar panels, the lander should last for two or three days. After releasing Schiaparelli, the TGO will change course to avoid crashing into Mars. It will then start a 12-month process of “aerobraking”—skimming the Martian atmosphere to bleed off energy—to change its eccentric orbit into a circular one. Europe and Russia will send a test lander Sunday on a one-way trip to the Martian surface, a key step in their joint ExoMars project to search for life on the Red Planet. Scientists believe Mars once hosted liquid water—a key ingredient for life as we know it. 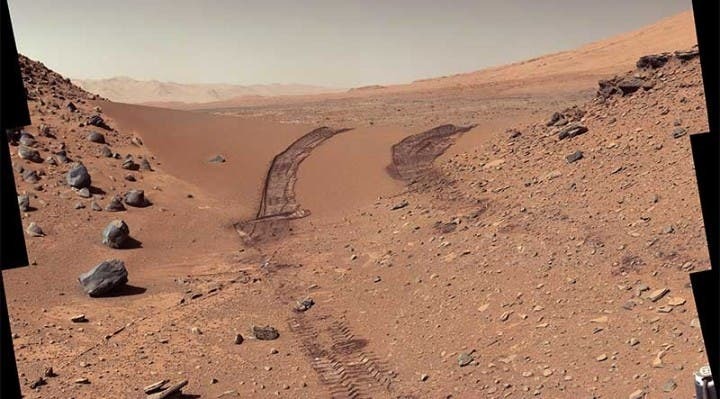 While the Martian surface is too dry, cold and radiation-blasted to sustain life today, this may have been a different story 3.5 billion years ago when the Red Planet’s climate was warmer and wetter. Science has long abandoned the hunt for little green men, though. Life, if any exists, is likely underground—away from harmful ultraviolet and cosmic rays—and in the form of single-celled microbes. Primitive or not, it would be the first time humans ever observe life on a planet other than Earth. The mission will also seek to learn more about geological process on Mars, and about the sand storms that change the face of the planet with their seasonal violence. TGO will taste Martian gases, looking specifically for methane. Methane is important because it may be a portender of life—on Earth it is mostly produced by biological processes. Previous missions had already picked up traces of methane in Mars’ atmosphere, but the TGO has much more sophisticated tools which scientists hope to tell whether it is biological or geological in origin. Methane can, theoretically, also be created by underground volcanoes. The rover will drill into Mars to look for evidence of buried, extinct life, or even live microbic activity. While diplomatic ties between Europe and Russia may be under strain, they collaborate closely on ExoMars—a shared project of Roscosmos and the European Space Agency (ESA).